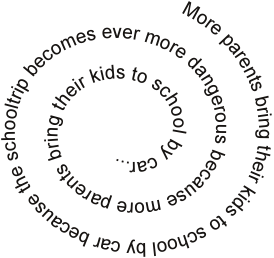 Many parents find themselves in a vicious cycle. As car traffic is increasing, more unsafe situations occur, which increase feelings of insecurity. As a result, parents only feel safe when driving their children to school by car, which in turn, results in more traffic in and around the vicinity of the school. The Traffic Snake Game aims to break this vicious cycle by encouraging schools, children and parents to adopt walking, cycling, car sharing or public transport when travelling to and from school.